Water-based, Organic, and ECO Friendly. Elite Moto Shine safely and effectively cleans, polishes, and protects without the use of water. It cleans and waxes all solid surfaces such as paint, plastic, fiberglass, glass, windshields and chrome. Elite Moto Shine contains high quality surfactants, polymers, and Carnuaba waxes. Each 32oz bottle will clean and protect an average size motorcycle 15-18 times! You will love the results! 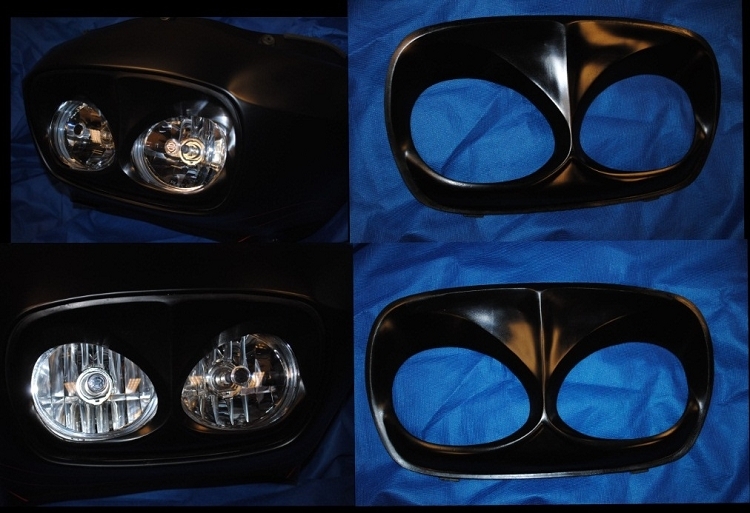 Our headlight bezel gives your road glide a nasty aggressive look. It fits 09 to present models. There will be a slight trimming needed for the 2012 models. It will fit earlier years but you need to upgrade your headlight assembly first to 09 or newer. Made of NYB polymer..which is stronger than ABS! Note some of the ealier 09 models came with the 08 headlight assembly. These bezels are designed for the later 09 to present assemblies.